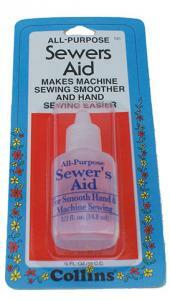 All purpose Sewers Aid lubricant applied to needles, makes machine sewing smoother and hand sewing easier. Reduces heat and static build up on the needle, for smoother penetration of materials. .
Sewers aid applied sparingly to spool and bobbin thread will lubricate the thread guides and tension as it passes through the machine for smoother sewing. Box of 6, purchase by the box. I sew exclusively on Spandex and elastic with velcro and need both ball point as well as one that doesn't get gunked up by the velcro or rubber from the elastic. Juki Exceed Hzl-300 sewing machine"
Sewers Aid Lube is especially useful for the home sewer. Apply sparingly to spool and bobbin thread and your sewing tools to make machine sewing smoother and hand sewing easier. .5 fluid oz.